Ray and Migdalia Etheridge are a husband-and-wife team who produce movies as a hobby. "Some people collect things...we make movies". 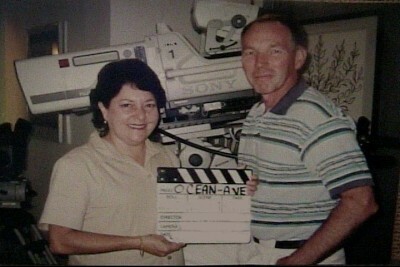 The films are shot in Palm Bay, Florida, in their home/studio. Ray is the writer/director/technical person who handles the shooting and editing. Migdalia handles the administrative end, and functions as the team's Producer/Assistant Director/Script Supervisor/and Makeup Artist. She also writes the lyrics to a song, which may be heard under the film's end credits. "HE'S DEAD" is a "micro-budget" film, which was lensed in Palm Bay, Florida. "Micro-budget" is a term often used to describe projects that are filmed with little, or no budget. Their movies are shot on Mini-DV, with a "film look" added during the editing process. The filming of "HE'S DEAD", the Etheridges' sixth feature film, was done on weekends over a 7-week period. Brian Parker, a wealthy businessman, is vacationing in the Bahamas when his boat is torched by an arsonist. He survives. but is faced with the realization that someone is trying to murder him. Parker teams up with the police to find whoever is responsible for the attempt on his life. A meeting is quickly called at the Parker estate for the reading of Brian's will. In attendance are his four business partners, his lawyer, and the family butler, who plays a videotaped message recorded by Brian Parker shortly before his death. The recording reveals that Brian made the tape because he suspected that someone was trying to kill him, and that someone in their group is systematically stealing millions of dollars from his company. The videotape drops the 'bombshell' that if the thief is not caught, and the stolen money returned to the Parker estate, NOBODY would inherit a dime. Matters are further complicated when a mysterious woman shows up to claim the entire estate, saying that she is Brian Parker's daughter. She becomes a target for murder, and is rescued at the last moment by police, who had been recording the meeting with hidden cameras.